Ritishma is a 6 year old girl. One of 5 children, her family lives in a very remote location, which is a 3km walk through fields to the nearest road. The family is extremely impoverished relying on occasional labouring duties that their father may find. They are extremely resilient but hopeful that an education will give their girls a better future. 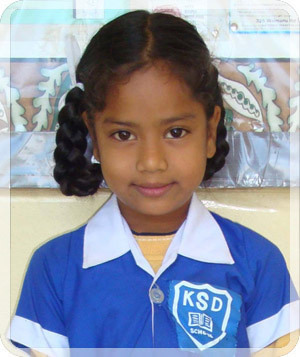 Ritishma enjoys attending school and her favourite school subject is stories. When she is not at school she loves to play with her sister. Ritishma travels to school each day walking an extraordinary distance of 8km to and from school. This takes 3 hours each way. What an amazing commitment to learning! When she grows up, Ritishma wants to be a "not sure". Ritishma is a hardworking child. She has shown a lot of interest towards her school work. At times she has lacked some basic school materials. Two other siblings at school with one already dropping out [due to lack of funds]. Assistance will definately keep her at school. 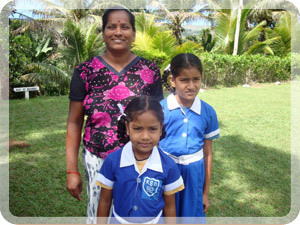 Ritishma and her sister are dropped to school by Mum who makes the long trip on foot every day.